Brent, as a company, is renowned for their pedigree in the pottery wheel industry, with a long-standing reputation in making top quality pottery wheels that can take a battering. Their model of Brent C Wheel is one such machine. Equipped with high-grade steel, aluminum, and plastic that can handle the abuse of a busy classroom. This is a pottery wheel that is safe to invest in; the healthy five-year warranty ensures that too. Does the Brent C Wheel tickle your fancy so far? Then read on and check out our Brent C Wheel review, which covers the specs, the good, and the bad, so you can be sure of your buying decision! Dimensions: 23 x 28.5 x 23.25 inches. Wheel Head Size: 14 inches. A three-legged design keeps the table steady, while the ¾ horsepower motor spins the wheel head. The drive belt has an automatic tensioning system that keeps the six-groove poly-v drive belt tight so that it performs at its best. Built from high-quality steel, with drip surfaces encased in equally high-quality plastic, this is a potter’s wheel that can tackle the significant weight of large projects. You can check out the guts of this machine, too, as Brent offers an autopsy of their machines with pride. The Brent C Wheel comes with an instructional DVD, a bat, and bat pins. Reversing the wheel direction is as easy as flicking a switch – literally! This feature offers a great deal of control over the clay and allows for potters to easily manipulate the wheel on a whim. Made from high-quality plastic, the splash pan is deep enough that long-term projects won’t be disrupted by frequent cleanings. The splash pan is also easy to disassemble and clean, which is always a plus in our books. Knowing that the floor beneath pottery wheels acclimate all sorts of nonsense, Brent has cast the foot pedal in corrosion-resistant aluminum. This means that run-off won’t do much harm, and the foot itself can take a battering. Pottery takes a long time. Sculpting the clay and smoothing it out can take hours, if not days, to complete. Therefore, it is a huge relief that the wheel turns near silent on a double row of ball bearings; no one wants to be hunched over a wheel that makes a terrible grinding noise! These ball bearings are a cut above the rest, and smoothly rotate the wheel at your will. Again, this is fantastic for intricate detail work; no matter how fast or slow the wheel turns, there will be no jiggling, wiggling, or waggling of the surface. The beauty of ball bearings is in their simplicity; they will not require service, and will serve you without trouble for years. Hosting 225 lbs. of centering capacity, the Brent C Wheel can handle the largest of pottering projects. For use in the classroom or commercial purposes, this is a pottery wheel that can tackle everything as the work-horse it is. This is a great feature for businesses that take commissions and need wheels that can handle a variety of different projects. At 14 inches in width, the Brent C Wheel is perfectly sized. It remains large enough to carry large projects, yet is not so large that it becomes obtrusive. This means that the overall machine won’t take up more space than necessary. Brent as a brand has been in the industry for years, and the motor powering the Brent C Wheel has been there right alongside them. If you have ever wanted to buy a product that you know has been put through its paces time and time again, then this is the pottery wheel for you! The DC motor is a tried and true model, a faithful companion to Brent’s potter wheels, and will remain strong throughout the life of your machine. Brent has a history in the ‘biz of creating dependable and quality products. The C Wheel is of this standard, and buying from Brent means buying quality. You’ll be investing in a company that has a load of experience creating quality products and knows just what they’re doing. Trustworthy manufacturers inspire confidence in their customers and Brent follows that path by including a warranty to protect customers against manufacturing and craftsmanship errors. Should you find a fault or defect in your pottery wheel, simply contact the company and they’ll be able to repair or replace your machine at no additional cost. The five-year warranty speaks a great deal about the faith they have in their products, and on their commitment towards doing right by their customers. You know your own limits, but, if you are on the hunt for a pottery wheel for classrooms or shared workspaces, then whatever machine you buy needs to be able to work with different people; not everyone is comfortable sculpting with their non-dominant hand! If this is the case, then a reversible wheel should be a high priority. Thankfully, the Brent C Wheel is equipped with such a feature. A top of the line control panel makes switching between clockwise and counter-clockwise a simple affair, giving you a pleasant amount of control over the wheel. Ah, cleaning. One cannot explore their artistic side without the accompanying mess. Working with clay is especially messy, though incredible fun, and can make cleaning up after a sculpting session quite the drag. So it is hugely pleasing that Brent has wrapped all the potential drip surfaces of the C Wheel in high-grade plastic, making it easy to clean run-off and clay away. Also, a good splash pan is always something that we can admire, and not just because we hate cleaning! Splash pans catch all the splatters of clay and murky water, keeping your floors and clothes safe – which is great for hobby, professional, and classroom settings. It’s easy to assemble too! Whether this is your first wheel, or you’re quickly trying to get this going before class, there won’t be much fussing around. To make things even easier, customers have also found this pottery wheel really easy to maintain when it comes to replacing parts or customizing it on your own – no surprise seeing how easy it is to assemble. The pieces including its modular connections are laid out in a way so that repairs and replacements are easy, making it less of a hassle for any user who wants to really make this wheel their own. There’s a ton of support on their website too, from pottery basics to equipment diagnostics and a full glossary of pottery and equipment terms. 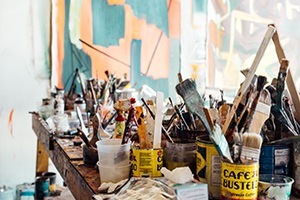 Art studios have to deal with a lot, and so do the equipment within them. Any studio that tackles students in particular needs to be made of tough stuff. This is what makes the Brent C Wheel great for classrooms: it can take a beating. Solid steel bodywork, high-quality plastic, and a cast aluminum foot pedal make for a potter’s wheel that can take the battering novices dish out. Given the design, even the clumsiest of students will have a rough time of accidentally (we hope!) tipping the wheel over. The whole machine is made of corrosion resistant material too, so water spills won’t be disastrous. Combined, all of this means that the Brent C Wheel can take just about any punishment that students can dish out. Such quality materials used in construction means only good things for the lifespan of the Brent C Wheel too! This wheel touches all the bases that every potter, pro or novice, is looking for. The motor packs a powerful punch, handling heavy loads and doesn’t back down when you need to add more. It continuously handles up to 225 lbs so you can let your creativity fly no matter how big your ideas get, and it handles it all smoothly. You won’t have to worry about any skips, jumps, or bumps when using this pottery wheel, no matter the project. What’s best is, no one has to hear these projects either! This wheel is quiet which is beneficial for both studios and classrooms. You’ll be able to get into your ‘zone’ without any whirring distractions which is also perfect for giving instructions without being drowned out by the sound of your wheel. In this video, you’ll see what the Brent C Wheel looks like out of the box. We really struggle to find a fault with the Brent C Wheel. Honestly! We could say that the price is something to balk at, but for the quality and pedigree behind the Brent C Wheel, the price really isn’t that out of the ordinary. It is best to think of this wheel as an investment. Classrooms and those that sell their craft professionally can comfortably look at such a price-tag as a venture in advancing their skills and capabilities. And, depending on where you purchase the pottery wheel, the company offers a $100 rebate on purchases to help with any stings from footing the bill. This is a pottery wheel that is pricey, yes, but well worth it considering the quality of the materials used in construction. Plus, few wheels run this silent and smooth. In short, the Brent C Wheel is a reliable work-horse for potters of any level. From beginners to pros, this wheel can be a potter’s dream with the promise of growing with you and your creativity. As mentioned, Brent pottery wheels are sought after for their quality, durability, and exceptional performance. It’s no surprise that these wheels are usually featured on the shelves of retailers. The Brent C Pottery Wheel is no different, available both in-store and online. But of course, you can also find this pottery wheel on Amazon. That’s all for our Brent C Wheel review. Consider the pros and tell us if you’d give this wheel a spin! We've found a winner with the Brent C Pottery Wheel, perfect for crafters from all levels. It's a sturdy, reliable machine, backed by a company who has been in the field for a while, knows what they're doing, and continues to put out high-quality machines. The price may be shocking at first, but trust us, this wheel is worth it.